This is a close up view of the centre of the Heart Nebula in Cassiopeia. 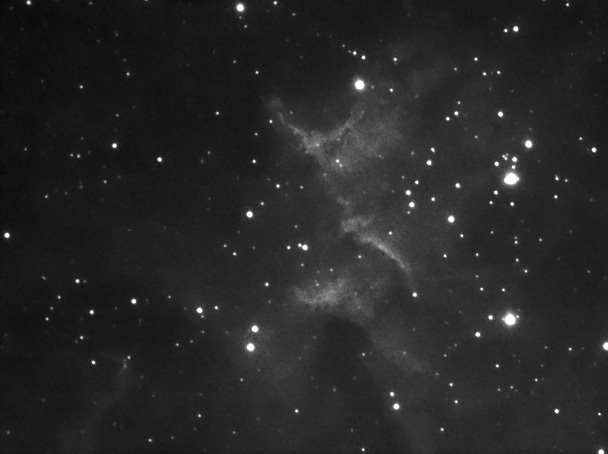 It was captured using my SC3 at prime focus of my MN56 with a 13nm Astronomik Ha filter. The image represents a total of 24 X 3min exposures. Amp glow from the CCD was a big problem with this length of exposure and needed some careful processing to remove. I really like this nebula with all the intricate twists and twirls of gas. The image was captured on 17th December 2006 at 00:22 from Bromley, Kent.